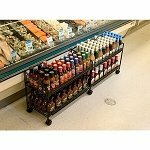 3 Way Rolling Grid Display is easy to arrange around your business from the front of the store to the back. 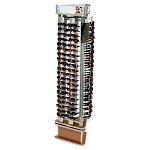 Included with your wire display stand are the connectors to keep your grid panels together and in place, a metal triangular shaped base with lockable casters and color options you can select from black, chrome and white. However, if chrome is the finish for you, the price is slightly higher due to the fact of using more expensive materials. The three-sided triangle shape showcasing stand let's you display three times the merchandise in one single display. Whether you have a retail shop or a c-store, you will find many uses for this mobile exhibit. A great choice for a floor rack to showcase anything from hanging products to candy items. Fits into smaller spaces to help make optimal use of store. Order your wire display stand today at Candy Concepts Inc for this phenomenal savings.